If you have not heard of fantastic photo book by Meryl Meisler, Disco Era Bushwick: A Tale of Two Cities, you must be living under a rock because everyone, including Bushwick Daily have been raving about this amazing photography project virtually non-stop since its launch during Bushwick Open Studios at Black Box Gallery at Bizarre. Meryl Meisler is a dear friend of ours, and so we were absolutely thrilled to collaborate with her and other wonderful local organizations and individuals to bring you an awesome historical photography walk of Bushwick, namely with Bridging Bushwick Sculpture Garden, Professional Women Photographers, naturally with Bizarre and with Adam J. Schwartz, an urban historian. 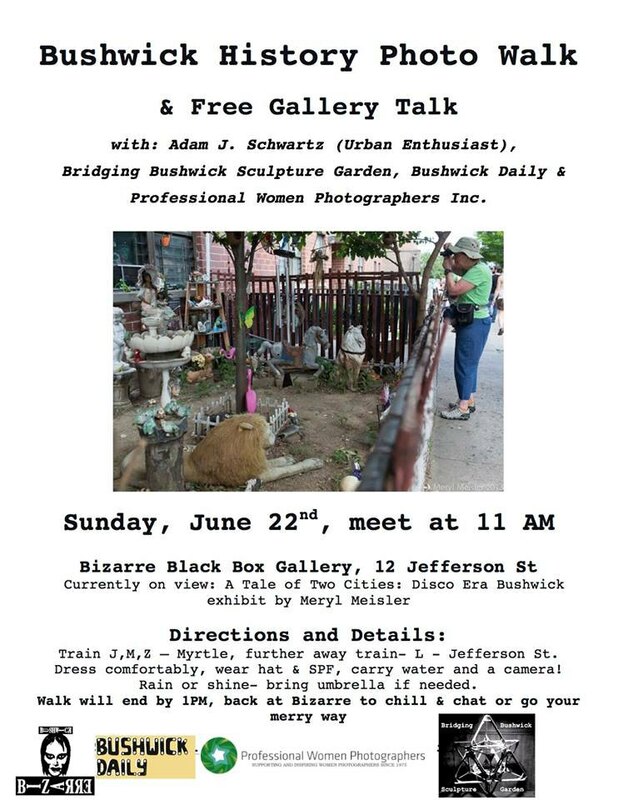 On Saturday, June 22, 11 AM you and your camera of any sort will be expected to show up at Bizarre Black Box Gallery at 12 Jefferson St. Meryl Meisler will start off the day with a gallery talk and historian Adam J. Schwartz will subsequently lead the tour. And what about the rest of us? Well, we will be snapping photos of our beloved Bushwick and enjoying ourselves while learning a thing or two about the history of the neighborhood we call home! Bushwick Daily will publish the selection of the most beautiful photographs and Instagrams. Speaking of Instagram, hashtag your photos #BushwickWalk to join the social media conversation. The walk is free and open to all photography and Bushwick enthusiasts of any level!